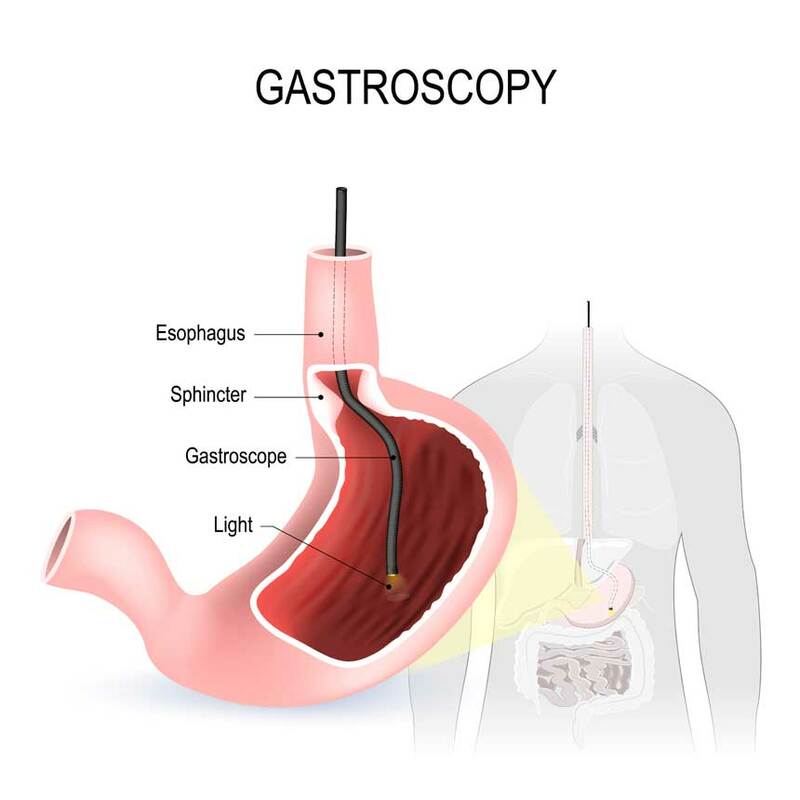 An oesophagogastroscopy (OGD) is a procedure that involves the use of a long thin (thickness of your index finger) flexible tube with a small camera at the end (endoscope) to look at the inside of your oesophagus, stomach and duodenum (first part of your small bowel). OGD is used to investigate symptoms such as acid reflux, trouble with swallowing, indigestion, nausea and vomiting, anaemia and abdominal pain. It is also used to monitor conditions such as Barret’s oesophagus, to investigate abnormalities seen on x-rays/CT/MRI or to check the side of a previous surgical procedure, previous polypectomy side or to check the healing of an ulcer. The benefit of OGD is that biopsies (small pieces of tissue) can be taken if any problem is found. In addition, any polyps found can be removed during the procedure while the general condition of the lining of the upper intestinal tract can be directly assessed. Prior to the procedure if you are taking any iron tablets you will need to stop them. Similarly if you are on any blood thinning medication such as warfarin or clopidogrel let your doctor know at least 7 days prior to the procedure. Anti-acid medication need to be stopped two weeks prior to the procedure. It is also important to let your doctor know if you have any significant health problems, have a pacemaker or any medication allergies. If you are just having an OGD you will need to be fasted from food and fluids for at least 6 hours prior to the procedure. You can have sips of clear water up to 2 hours before the procedure. This is to make sure your stomach is empty for the procedure so that the lining of the intestinal tract can be clearly seen. OGD is a procedure that usually lasts 10 minutes. It requires the use of a throat spray to numb the back of the throat and does not frequently require any painkillers or sedatives. If you would like to have sedation please discuss this with your doctor. If that is the case a small tube (cannula) will be placed in one of your veins in order to give you a sedative to make you more relaxed and the procedure more comfortable. Once you have removed any false teeth or dentures, a plastic mouth piece is placed in your mouth to protect your teeth. Lying on your side, the endoscope is passed to the back of the throat and once in the right position you are asked to swallow the endoscope to help it pass down the oesophagus into your stomach. Photographs of the intestine, stomach and oesophagus will be taken as well as any required biopsies while any polyps will be removed. The procedure is not painful but you may feel bloated because of the gas put inside your stomach to get good views. After the procedure you will be taken to the recovery room. You will be informed of any follow-up arrangements in anticipation of any results from biopsies. In general, you should be able to return back to normal activities straight away but avoid eating for 1hr after the procedure. If you elect to have some sedation you will not be able to drive for 24 hours, you need to avoid alcohol and signing any important legal documents and need to ensure that a responsible person will be with you for at least 12 hours. OGD is generally a very safe procedure. Complications occur rarely and include the risk of bleeding (less than 1 in 1000), perforation or tear through the oesophagus (less than 1 in 2500), rare medication allergies and risk of heart attack or breathing difficulties. There is also a risk of sore throat or damage to teeth or bridgework. In less than 1 in 20 procedures the procedure may not be completed due to technical difficulties. Alternative investigations will then be discussed with you and arranged accordingly.